KOKOMO, Ind. – Four days after Indiana University Kokomo downed Purdue University Calumet in the Illinois Institute of Technology Kickoff Tournament, the Peregrines traveled to the City of Firsts and returned the favor by downing the Lady Cougars in a five-set volleyball thriller (23-25, 25-14, 15-25, 25-18, 13-15). The loss to a Calumet team that arrived short-handed due to injuries was hard for the Cougars to accept. The decisive set saw the home team nearly complete a come-from-behind victory after trailing 8-3, 13-7 and 14-8. A Calumet error followed by a long baseline hit started the momentum in the Cougars favor, cutting the lead to 14-10. Rachael Williams (Kendall, Wis./Royall [Goshen College]) entered to serve for Kokomo, and she helped rally the Cougars thanks to kills by Brittany Nelson (Delphi, Ind./Delphi [Kankakee C.C.]) and Rachel Allen (Lizton, Ind./Tri-West) and a Purdue hit out of bounds. But Calumet’s Jesse Miller (Grove City, Ohio/Grove City) raced to the net on a set and fired off the match-winning kill. The return of Nelson to the Cougars lineups meant a small learning curve for the squad, and while not making excuses, Snoddy said both the coaching staff and the team need to learn the new roles that are on the court. The Lady Cougars got off to a slow start in all three sets they lost. In the first set, they scored the first point on an ace by freshman Cortney Hanson (Winamac, Ind./Pioneer), only to watch the Peregrines score the next six points and 11 of 13. Kokomo tried to get back in the game. Trailing 11-3, Allen blasted a kill and Calumet had an unforced error to cut the lead to six. Then Megan Riley (New Palestine, Ind./New Palestine) bookended a pair of blocks around a pair of Heather Tolson (Frankfort, Ind./Clinton Prairie [Kankakee C.C.]) kills to trim the Calumet advantage to 11-10. But that is as close as the Cougars would get in the 25-23 loss. In set three, the Cougars trailed 1-0 and 10-5 en route to the 10-point loss. And in the fifth set, Calumet (1-4) scored the first two points and five of the first seven. Snoddy pointed to a bright spot as she thought her squad maintained a competitive attitude the entire match. She noted that on previous nights, the squad did not respond as well to adversity and may not have been able to make the comeback like they did tonight in the fifth set. The Lady Cougars (1-5) return to action on Aug. 31 and Sep. 1 at St. Xavier University before traveling to Anderson University on Sep. 5. They return home on Sep. 20 for a 7 p.m. contest against Indiana University Northwest at the new home of the Lady Cougars – Maple Crest Middle School (located across from the IU Kokomo campus). 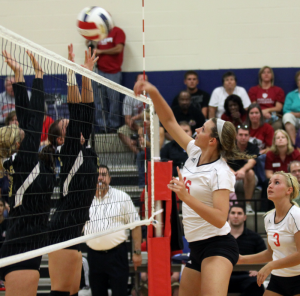 This entry was posted in IU Kokomo, IUK, Volleyball. Bookmark the permalink.